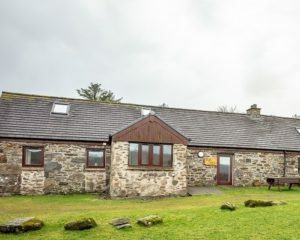 In 2004 the old stone barn on Saorphin was converted into two comfortable self-catering holiday cottages, and in 2009 a ruined blackhouse was converted into a self-contained one-bedroom Bothy. All three holiday cottages can be rented individually or together as one large unit. 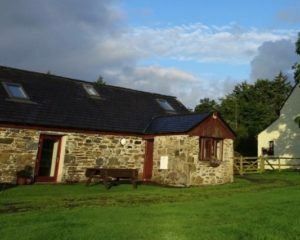 The two larger holiday cottages are side-by-side, one at each end of the old barn and have inter connecting doors that can be opened to make them one, but they are set out in a way that makes them comfortable and cosy for 2 – 4 people. Both these and the small bothy nearby are contained within a fenced garden. All the living rooms have doors opening onto the garden where you can sit out on the picnic benches to admire the view or have supper or drinks outside. 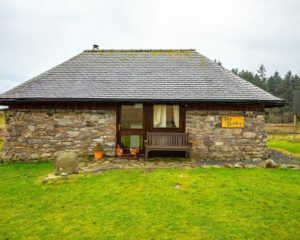 The cottages all have Freesat TV, Wi-Fi and payphones. There is a long farm track to the cottages so please drive slowly. In season the cottages are let Saturday 4pm to Saturday 10 am to allow time for the changeover cleaning to be done. Outside the main season we are happy to do shorter mid week or long weekend lets. The cottages will be open upon your arrival so please make yourselves at home. Rates shown are per week, but outside the main season do contact us to discuss special rates for shorter stays such as weekends or mid week breaks and multiple week bookings. A maximum of 2 well–behaved dogs are allowed in Tigh Mhor and Tigh Beag at an additional charge. Remember that this is a working farm and has livestock so please walk your dogs responsibly. Bed linen and towels are provided for the house but Beach towels are not provided. Electricity is included in the cost of rental. Please note that all three cottages are non-smoking.